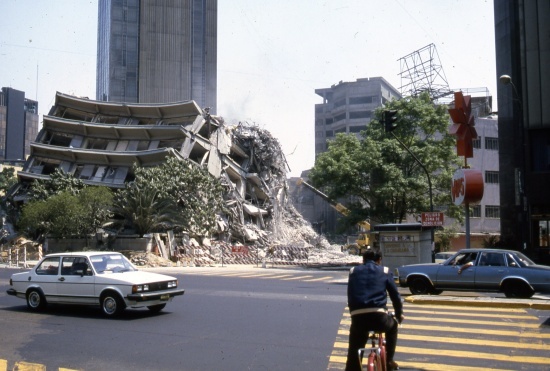 The worst earthquake disaster in modern Mexican history occurred thirty years ago this week. On Thursday 19 September 1985 a magnitude 8.1 earthquake struck at 7:19 a.m. and lasted a full two minutes. It was followed by a 7.5-magnitude earthquake 36 hours later. These earthquakes resulted from the Cocos Plate (see map) pushing under the North American Plate. 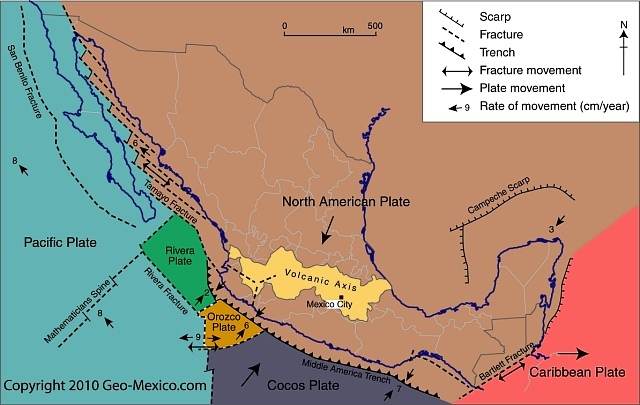 While the epicenters were 50 km off Mexico’s Pacific coast, near the Michoacán-Guerrero border, most of the damage occurred 350 km (215 mi) away in Mexico City because the city center’s subsoil, being former lakebed, is very unstable. The clay and silt beneath the city is up to 50 m thick in the area that received most damage. Geologists have likened the effects of the earthquake to the shaking of a bowl of jelly. Further damage was caused by liquefaction, a process in which water is squeezed rapidly through the pore spaces in soil, dramatically reducing its cohesion. The sediments beneath Mexico City amplified the ground motions during the earthquakes and many buildings were stressed well beyond building code limits. Damage estimates range upward to 10,000 deaths, 50,000 injured and 100,000 homeless. More than 500 buildings collapsed, and a further 600 of the 3000 damaged structures were subsequently razed to the ground. The destruction was concentrated in a relatively small area near the city center and included many public buildings, such as government offices, as well as 11 hospitals and clinics, numerous multi-story apartment blocks, 11 hotels and 10 banks. More than 1600 school classrooms were damaged. Buildings of between 6 and 15 stories were especially hard hit. The underbelly of the city was exposed; dozens of textile sweatshops were destroyed. The damages revealed many instances of poor construction standards and of poor enforcement of building codes. Well-built high rises such as the Latin American tower, designed to be earthquake-proof, were unscathed. The total cost to the Mexican economy was estimated to exceed $5 billion, equivalent to 2% of the country’s GDP (Gross Domestic Product). The disastrous 1985 earthquakes led to much tighter building codes, equal or superior to anywhere in the world, and to the formation of well-trained emergency search and rescue brigades. They also resulted in the establishment of a Seismic Alarm System which provides a 50-second warning for any earthquake measuring over 6.0 on the Richter scale occurring off the coast of Guerrero or Michoacán. This is an excerpt from chapter 2 of Geo-Mexico: the geography and dynamics of modern Mexico. Many more details of Mexico’s geology and landforms are analyzed in other parts of the book; take a look using Amazon.com’s Look Inside feature before buying your copy today!